This is an introductory book about the rapid model prototyping language R. It is especially suited to programmers and researcher in finance and insurance. 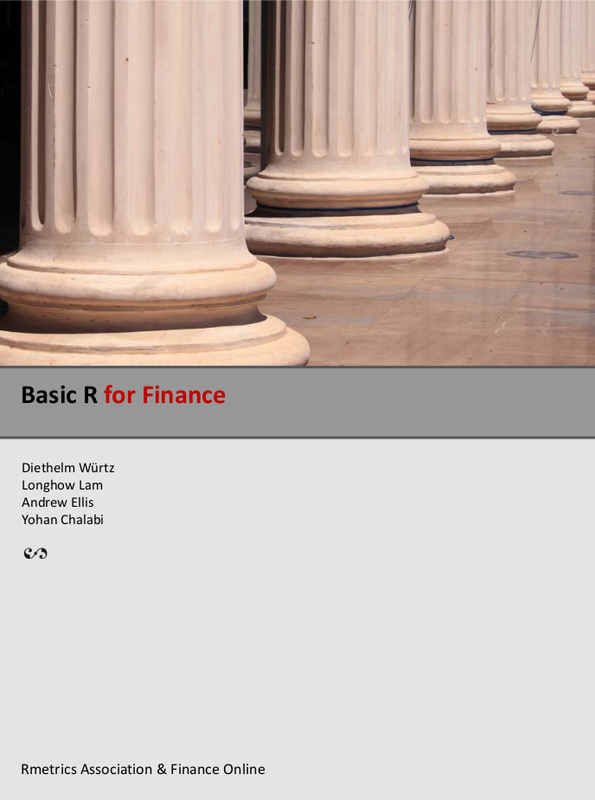 What sets this book apart from all the other introductory R books is the number of examples from computational finance and financial engineering. Part 1 to 4 give an introduction to the R language and environment: Computations, programming, plotting, statistics and inference. Part 5 to 8 are dedicated to case studies: Utility functions, asset management, option valuation and portfolio design. The NEW Update 2015 supports R Version 3.2. (ETH) in Zurich. Diethelm is teaching regular ETH lectures and seminars in Computational Finance and Financial Engineering. He is involved in the organization of the “Rmetrics Summer Schools” and in several international workshops, courses and meetings in Europe and Asia. He is President of the Open Source “Rmetrics Association”, Senior Partner of “Finance Online GmbH” and Co-Founder of “Sidenis AG” in Zurich. Tobias Setz holds a master in Computational Science and Engineering from ETH in Zurich with a major specialization in theoretical physics and a minor specialization in financial engineering. Currently he is doing his PhD in the Econophysics group of Prof Diethelm Würtz. In his theses he focused on stability indicators to describe the condition of financial or economic markets or to improve trading strategies. Besides this academic work, he is also a developer of the R/Rmetrics packages covering time series analysis and portfolio optimization (www.rmetrics.org). Andrew Ellis read neuroscience and mathematics at the University in Zurich. He did a Student Internship in the Econophysics group at ETH Zurich at the Institute for Theoretical Physics. Andrew is worked on the Rmetrics documentation project and co-authored this ebook on portfolio optimization with Rmetrics. Yohan Chalabi has a master in Physics from the Swiss Federal Institute of Technology in Lausanne. He made his Doctorat Degree in the Econophysics group at ETH Zurich at the Institute for Theoretical Physics. Yohan is a co-author of the Rmetrics packages.